Ali is a major disappointment. What could have been a great insight into the life and mind of an American icon instead leaves us even more confused as we were to begin with. 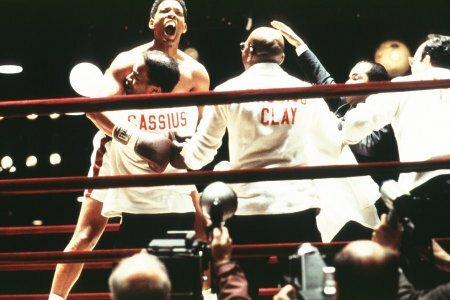 This is certainly not to say that Will Smith does not do an adequate job at portraying Cassius Clay, Jr. / Muhammad Ali. In fact, Smith's performance is simply extraordinary! However, unfortunately for him and for all of us, no amount of acting, by Smith or the rest of the talented cast, could have saved this movie from its own self-destruction. And this movie was doomed from its very conception. You see, when making a biographical movie such as this, there are two key ingredients to the entree, so to speak. First of all, the story must tell us about the major events of the person's life. These should be arranged in such a fashion as to naturally lead us to the second key ingredient which is an insight into the mind, the emotions, and the psyche of the person in focus. Writer Gregory Allen Howard and director Michael Mann manage somehow to accomplish neither of these. You see, this movie is not about the life of Muhammad Ali. It is about 10 years of his life, which is just a tiny slice of the cake, in my opinion. But what is even more frustrating to me is the fact that even with an in-depth look at these 10 years, I don't feel like I understand this man at all. And how does a movie get us to feel what the main character is feeling? First of all, we must experience an event with him. Secondly, we must witness and understand his reaction, which is usually best conveyed by the actor's facial expressions. And finally, we must listen as the character engages in dialogue with others. Thus, as I have already pointed out, the movie is quite short on events in the life of Muhammad Ali. Hurting the second and third points that I made is the fact that the Ali in this film hides his emotions and does not express himself, at all. Oh sure, he is at no loss for words when in front of the TV camera or in the boxing ring, but these are charades that he puts on for others. Even more frustrating is the fact that we see him make many radical decisions in this film, such as becoming a Muslim, changing his name from Cassius Clay to Muhammad Ali, refusing to be drafted into the Vietnam war, etc. We also see him turn his back on his family, friends, and wives. But why? What prompted these decisions and his inevitable emotional isolation? These are key questions that the movie simply does not answer. And it is not like the movie did not have enough time. In fact, they manage to drag this thing out for 2 hours and 38 minutes without giving us any insight into the mind of Muhammad Ali, and without entertaining us much either. What takes up all of the time, you ask? Well, it isn't boxing (there are only 3 fight scenes which don't last very long). And it isn't dialogue. It's music. 60's music. Over and over and over. The film begins with what seems like a 15-minute Sam Cooke song. Then the rest of the film goes like this: 2-3 minutes of talking, 5-10 minute 60's song, 2-3 minutes of dialogue, 5-10 minutes of song, repeat until 2:38:00. If Michael Mann was so musically inclined, I must ask him, "Why not just make this a musical?" Ali: The Musical -- I would be OK with this, even if Muhammad Ali was singing the entire film, so long as he was singing words which would reveal a little something about himself. But I do not want to take anything away from the cast (this movie has already taken enough away from them as it is). As I mentioned earlier, Will Smith really is amazing. He bulked up quite a bit for this role (though I must say that it wasn't all muscle), and his hair seemed to match Ali's quite well. But not only did he look the part, but his movements also matched that of Muhammad Ali. In the ring, his light, bouncing steps ("I dance like a butterfly, but sting like a bee.") were right on. His voice was also very convincing in tone and emotion. 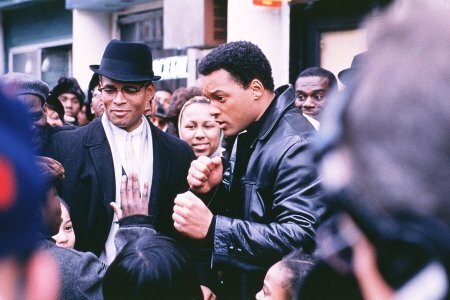 In fact, there were several instances in this film where I just completely forgot that this was Will Smith and I felt that I was watching Muhammad Ali. What greater compliment could someone give an actor who means to portray someone else? There are other would-be stars in this film as well (again, were it not for the horrible script, directing, and editing). Most notable is Jon Voight (below - middle, who in 2001 also appeared in Pearl Harbor as FDR, and Lara Croft: Tomb Raider as Croft's father -- boy does this guy have a problem picking out films!). 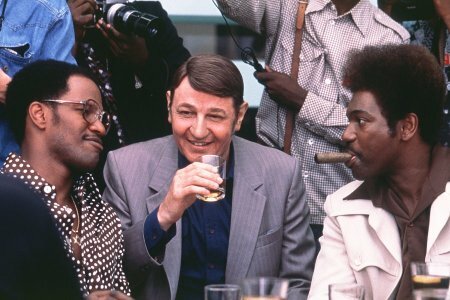 Voight becomes (through several hour make-up sessions each day) the one-of-a-kind TV announcer, Howard Cosell, who had a particularly interesting relationship with Ali. Jamie Foxx (below - left) also does a pretty admirable job as Drew "Bundini" Brown. Most notable from his performance is his hair. He grows bald throughout the film. In the end, however, we come away with nothing. Ali beats Foreman in the Rumble in the Jungle. He is the Champ once again. On one hand, as I have mentioned, I was frustrated that the movie ended here. To me this is only the beginning (Hey! Maybe they'll make Ali II, III, IV, and V just like the Rocky series. Heaven forbid!) I feel that the most dramatic portion of Ali's life is his battle with Parkinson's disease. Who could forget the moment when he lit the Olympic torch in Atlanta? What is most fascinating to me is the ultimate irony in how this man who once proclaimed, "I am the GREATEST!" could now be reduced to barely being able to walk, speak, or even feed himself. It is analogous to the sinking of the Titanic, after many had tempted fate by stating, "Not even God himself could sink this ship." On the other hand, I was quite relieved that the movie ended when it did. After all, I had been sitting there long enough, getting nothing out of it but getting sick from all of the music. And besides, I really had to pee! Not even a great performance from Will Smith could save this movie about a champion from defeat. Wanna see a great movie about a real-life boxer? Then see The Hurricane. Wanna see a great boxing movie? Then see Rocky. How would you rate the movie Ali? There have been 10036 people to visit this page since Mon, Jan 7, 2002. And you are the first person to visit this page today!